Let’s do something amazing this week. Let’s make a difference. Let’s get you some more customers. Let’s get you some more sales. Let’s remove the barriers to your customers. So when a customer, or a potential customer, has any interaction with you, how many barriers are in the way? What things make them think, “ah!” For example, do you have a free phone, or a toll-free phone number? No? Then get one. You’re thinking, those of you that don’t have one, you’re thinking, “oh I can’t really afford that,” that’s because you have no idea what it costs, because you’ve never looked into it. It costs hardly anything. We get phone calls, in my fire protection business, we have a team of customer service people, because people are phoning us all day into the evenings, over the weekends, and our phone bills are less than they used to be in my old business 10 years ago. Go in the UK, go to somewhere like number store. In the USA, oh you’ve got so many, just Google free phone numbers, toll-free numbers. With someone like number store, you just pay a monthly fee, and the actual phone call costs are ridiculously low. The world has changed, the world of telecoms has changed, everything costs less. Also for those of you that still use a fax, and funny enough, we use a fax, and people do fax stuff in. So cater for every single need. That means people want to use faxes, who knows why? What is a fax? But we have a free fax number, and it is different than our phone number. We can afford it, because it really is very very cheap. We have a free post number address. So when someone actually wants to mail something to us, they don’t even have to put a stamp on it. We pay at errand. It costs hardly anything. You can afford a stamp surely. We actually at Fire Safety Online, we have the address Free Post Fire Safety. If you write that on an envelope or something, it will get to us. It was easy to set up, it didn’t cost a lot. Consider it for your business. Imagine how that will help customers. Imagine how it upgrades you slightly in their mind. It means that, well when you charge slightly more than everyone else, it’s justified because you are a class above everyone else. Other barriers are open hours. Do you have a website? Does it have a telephone number, or overseas, your toll-free number? Does it have it on a very easy place to find? Next to that phone number, do you have the hours that people can phone you? This is the world wide web, my friends. People can phone from Australia, they have no idea what hours you are open. If you happen to have your cellphone number or your mobile number on that, people could ring it anytime from anywhere about anything. Remove all these barriers. You can go further. You can remove barriers from your staff. Be nice to your staff, involve your staff, remove the barriers, remove any potential resentment points. Remember resentment points can come from customers, resentment points can come from staff. You need a happy staff to deal with your customers that removes another barrier. Just think it’s a fresh new week, think of all these things. 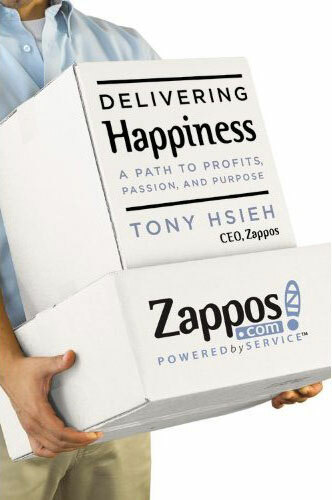 The book that I am recommending this week is “Delivering Happiness” by Tony Hsieh. He is the CEO of Zappos. Zappos is one of my favorite companies. I’ve never bought a single thing from them because it’s in the USA, and does not operate in the UK. It is now owned by Amazon, but it’s left on its own as Zappos.com. They have the most amazing customer service. When Tony joined, I think he had to turn over a couple million, and a few years later, it had a turn over of a billion dollars. That “Delivering Happiness” book explains where Tony came from. It explains his theories and explains how he built the company, how he pumped his money in, how he built new systems. He tried selling shoes online, had not been done, and so they developed the systems, they built the warehouse, the warehouse system, how they learned, but how they developed the culture. The culture that continues to this day. You can contact Zappos and ask them to send for free, anywhere in the world a copy of their culture book that they produced. They will gladly send it to you. Despite the fact you could be in a country that couldn’t ever buy from them. That is customer service to the maximum. The “Delivering Happiness” book makes you feel good, and it is a fabulous story of a business that gets built. He invested his last money in there as did Elon Musk in Tesla, and went for it. It is amazing. He almost blew a fortune, and it paid off. He tells the whole story, I highly recommend it. I loved it. Go read that but remember, make this a week for customers. Do any of these things I mentioned, one at a time or altogether, just do it because you know it’s going to work. 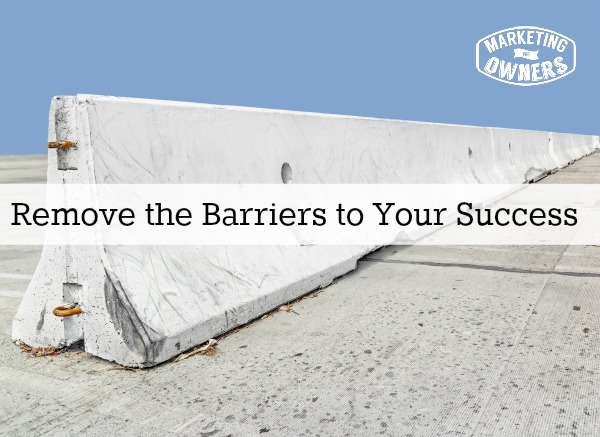 What barrier is stopping you from succeeding?